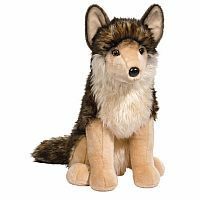 Regal and quite exquisite Leeloo the large wolf stuffed animal will have you doing a double take! Although known for being a bit vicious, we promise that our brown and grey wolf stuffed animal is anything but. Sitting pretty at 21″ tall Leeloo will win you over with his long, luscious fur, tip dyed for extra realism and interest.